We regularly provide cut-out letters to clients right across this continent, in many different materials. Wood, metal, plastic, all of these can be turned into beautiful letters that will enhance the look of any project. This an excellent solution for permanent installations, or wherever you need a high-end look. They are normally installed using pins and spacers fixed to the backs of the letters. We can make them even more beautiful by raising them off the backing piece, and installing LED lighting behind each letter to create what is referred to as ‘Halo-Lighting’. This is the ultimate in high-end looking signage. Indoor or outdoor, short-term or long-term, we can provide you with the right materials to suit your projects’ requirements. Banners can be made to withstand the high demands of outdoor installations, or be printed on paper for cost-effective one-time use. Trade show graphics can be printed directly to flat panels that go directly into your display. Foam board, styrene, acrylic, wood, corrugated plastic, PVC……any of these substrates can be used to create the sign that is best for you. Sometimes signage is required to blend with the look of a particular building, or to serve a special function. We can provide the correct materials and specifications to satisfy the requirements of any situation. If we are to match existing signage, a Site Visit is often required. Interior signage can be even more demanding, from sliding ‘vacant / occupied’ signs, to changeable insert signs. We can combine materials to create high-end looks for financial institutions, schools, government offices, or corporate settings. Rapid Signs is also licensed to provide Braille signs, and we can add Braille to any sign where this is specified. If you have a project that requires special attention, we can help. They may sometimes be quite small, but a decal can be a powerful tool for promotion. We produce decals for all types of uses, P.O.P. displays, public events, safety precautions, instructions, product labels, etc….All of our processes use materials which have a minimum 3 year outdoor lifetime…serious decals! Check the PROCESSES area of our site to learn more about the different ways a decal can be produced. Using the same materials and equipment as for smaller decals, we can produce large-format ‘decals’ for a variety of uses. They can be laminated to a backing substrate of some kind (foam board, corrugated plastic, plywood, etc. 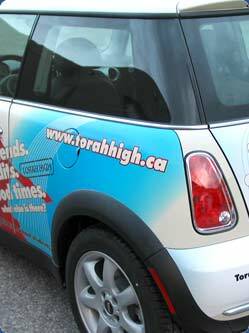 ), or applied to a vehicle to create visually stimulating, full-colour mobile advertisements. Supply your own files ready to go, or have us do the work, and we’ll give you a beautiful finish every time! If you are looking for a specific product and you don’t see it here, simply give us a call and describe what you’re looking for. There are many custom applications that require special attention, too many to list here, that are not ‘standard’ types of products. In these cases, the more information you can provide to us, the easier it will be to determine how we can produce the job, and what the cost will be. Our wide array of equipment is limited only by imagination, so don’t hesitate to call and see if we can help with your next special project!